Over the past two weeks, we have been challenged by obstacles that need to be overcome (Netzach) and surrendered to or at least suspended our notions of what the outcome of our plans need to be (Hod). Yesod is also defined as “truth” or “integrity” and in this context, it challenges us to take one last hard look at what we are committing to and whether we really are going to act with full integrity. There is a relationship between integrity and self-doubt. We can doubt in ourselves—can I really follow through or is what I am changing really significant? Be encouraged that even a small change is very important as any change is significant in realizing that change is possible. While doubt may only seem like another obstacle, without the doubt we might not know how crucial the change is, otherwise why the inner resistance? Without a doubt any change is significant. Where are the Hebrew slaves on their journey? They have arrived at the place they call Refidim—a name that implies a weakening of resolve. Water once again becomes a concern and then, without provocation, they are attacked by the Amalekites. What ensues is a physical and spiritual battle with the inner sense of self-doubt. Amalek is explained in Kabbalah as an internal provocateur; that aspect of our self which plants and nourishes a lack of confidence and distorts our aims. We must be the sentinel to backsliding or retreat into old patterns and remain steadfast in our commitment to spiritual growth. Chesed is the love of self (and others) that is motivating the change. We have to remind ourselves of the original reason for picking the change we committed to (and you can still expand on what you are committing to change) and see now how love can aid us in remaining with integrity about our plan for change. Gevurah is self-determination, self-definition. There will be doubt and that is the nature of things—to doubt. Strength is not eliminating doubt; rather it is living with it and still moving forward. We are now ready to face the doubt and even use the feelings generated by the doubt to re-enforce our determination. Take out the blueprint and look at it in light of the doubt you have experienced over the last two days. Now is not the time to evaluate the plan as much as it is to evaluate your determination in light of doubt. This is your final edition of your plan. You are all in! The determination of Yesod is bolstered by the energy of Netzach to overcome any and all obstacles. Self-doubt is removed through the awareness that all can be accomplished even though the obstacles may now be clearer as seen through the filter of doubt. Be truthful about the obstacles—don’t let them serve as a final deterrent to your plan for change. We remember that surrendering is part of the process of finding our truth. We are never alone in our growing and others can help. If we share with others they can help to insure that we remain in integrity. On this day we look at our relationship with others—are we in consonance with them or struggling with them? In the battle for determination over doubt, we can reach out and ask for support and encouragement. There is the naked truth where we drop all facades and face our truth. 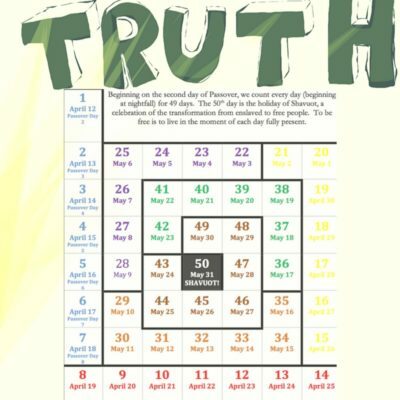 This day is about alignment around the change we are engaged in, to be convicted that the change reflects not only the truth but the whole truth and nothing but the truth. We can also ask those we trust, to be honest with us, to reflect back to us whether we are indeed in integrity about the change(s) we are committed to. It is now time to manifest the hard fought truth. Are you ready to manifest the change? Today is declaring I am ready. I leave any vestige of doubt behind.